What do I think of the lip butters? These lip butters are a lipstick/lip balm hybrid. I have very little experience with lipstick and to me, this feels similar to the only lipstick I've ever had (L'Oreal Colour Juice Sticks) but I've been reading that the Juice Sticks are also close to a lip balm/lipstick hybrid and also more sheer than other lipsticks. I think the Revlon lip butters are a bit more moisturizing and I found the product to be very creamy to the point of it smushing a little in the tube when I did something wrong with it. It applies smoothly and nicely. Tutti Fruitti is an orangey colour that I was most excited about trying especially following what I think was a success with the Julep lip gloss (Poppy), another coral colour* (SEE POST). Looking back at that Julep picture, I can't believe I was shocked at how I looked with the colour on my lips. 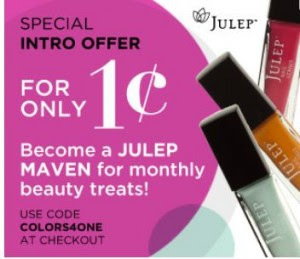 Being used to lip balm, the Julep gloss was quite a big change. Well, now I've graduated to a different lip colour level because even "flame" (lipstain, 3rd picture) isn't as shocking to me as Julep was not so long ago. Sweet Tart is my "coup de coeur". It really is a sweet colour and I feel so pretty when I put on a light layer like in that middle picture. I'm discovering a love for pink makeup lately with this Revlon lip butter and the Lippy Girl blush I got recently in a light pink colour. It makes me feel girly, cute and pretty. What do I think of the lipstain+balm? This lipstain is in marker form. Yep, like a good old scented marker you might draw flowers with. After colouring in your bare lips, you then put on the balm that comes on the other side of the pen-like product and there ya go, it gives it some hydration and a little shine and makes the whole thing look almost like lipstick. I like the balm itself well enough and I find it hydrating and a nice kind of balmy shine. What is weird about the balm is that it's just sticking out of its side and is not retractable. A person has to be careful not to apply crooked pressure on it or knick it with the cap. It seems pretty strong and solid though and hasn't caused me problems. The only issue I had was that when removing the cap over the balm, the whole balm came off and left me looking inside at the marker "reservoir". Let's just say it could use better packaging. I love that the stain gives such dark colour without actually wearing lipstick! It was long-lasting and did not get all over things (baby, cups, towel, etc.) like normal lipstick and the lip butter does. I could pretend I wasn't wearing any colour at all and go on with my life with painted lips. I didn't have any problems with the colour fading awkwardly and making a ring around my lips or anything like that. My lips stayed dark for a long while but I was able to remove it fully with some makeup remover. The negative is how uneven it looks in the picture (click to enlarge if you need to). It didn't appear so uneven in my bathroom but I guess it was... So we must be careful about that with this product and it would probably work better with people who have very smooth lips which I don't really. They are not chapped at all, they just aren't the smoothest. I find the colour a bit "much" on myself anyway, at least for a day to day look, but my love for the no-worries aspect when it comes to kissing my baby makes me way to try with a more neutral pinkish colour. I recommend the lip butters for sure. I think they're great lipsticks especially for people who are used to lip balm but want extra colour. They are pigmented and really add colour to your lips while not feeling dry or heavy. I like the lipstain+balm but would not recommend it to people with uneven lips. I love the idea of a lipstain though and I'm going to continue searching for one that works better on me. I was actually trying to buy the Revlon Just Bitten Kissable lipstain when I got this one and I might have to give it a try to see if it's any easier and better than this marker style lipstain. Still, I'm not giving it a bad review - the experience was still positive and I'll continue using it. I just can't 100% recommend it based on my experience. My balm end of the stain broke off the first time I opened it. I was like how do you you twist this thing down? Yea weird. ellesy: I will check the Annabelle product, thanks! amna: If you have super-smooth lips, go for it! Mona: Ouf I can imagine this happening... It's totally weird.